What’s not to love about mussels – they’re succulent, tender, salty and a bit sweet. Many of us have gone to the fish market or local grocery store and grabbed a bag of mussels sitting on ice and cooked a great bowl of mussels. But this time I wanted to go to the source. I wanted to be my own fishmonger. I wanted to grab my own dinner literally from the earth. 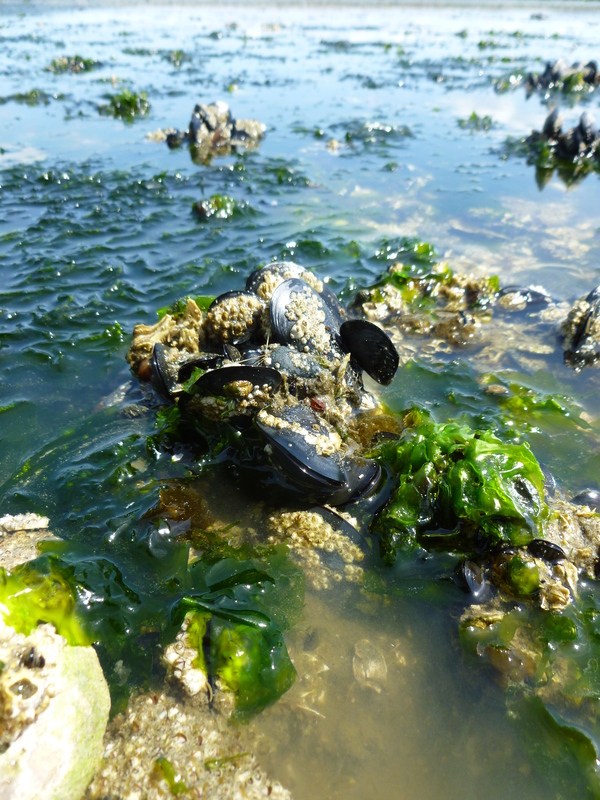 Hunting mussels can be a solitary adventure for the day or a great bonding experience with friends. In my case, a group of friends went on the expedition and later each of us prepared the mussels in a different way. A ferry and a short drive were the only things that stood between my posse and those black pearly mussels. At Double Bluff State Park on Whidbey Island we walked along the beach at low tide and, at first, saw no mussels. But as we hiked closer to a large rocky bed we hit the jackpot. Soon I realized we were literally on a blanket of mussels. Thousands of them clutched to each other and small rocks. Plucking the mussels only the size of my thumb or bigger, I found my bucket full within a couple hours. It was literally that easy. Back in the kitchen we had a mussel feast fit for the sea gods. The bivalves were so fresh and flavorful. Mussels are a great choice of food for one person to prepare for many reasons. Within minutes you can steam the mussels in white wine and shallots or garlic and finish with fresh herbs. Just grab some french bread for dipping and a glass or two of Pinot Gris wine for sipping and you are set to relax after a hard day of work. Also if you are entertaining friends, a quick mussel dish won’t keep you hostage in the kitchen while the rest of your soiree is kicking into high gear. Below you’ll find tips on harvesting mussels, hints on preparing them in the kitchen and a great recipe. Don’t be intimidated by them and feel free to find your favorite way to enjoy them. Get an annual shellfish license. I got mine at a local Fred Meyer store. Wear comfortable hiking boots or durable sandals – avoid flip flops so you don’t cut your feet. Bring gloves and a large bucket with a lid. 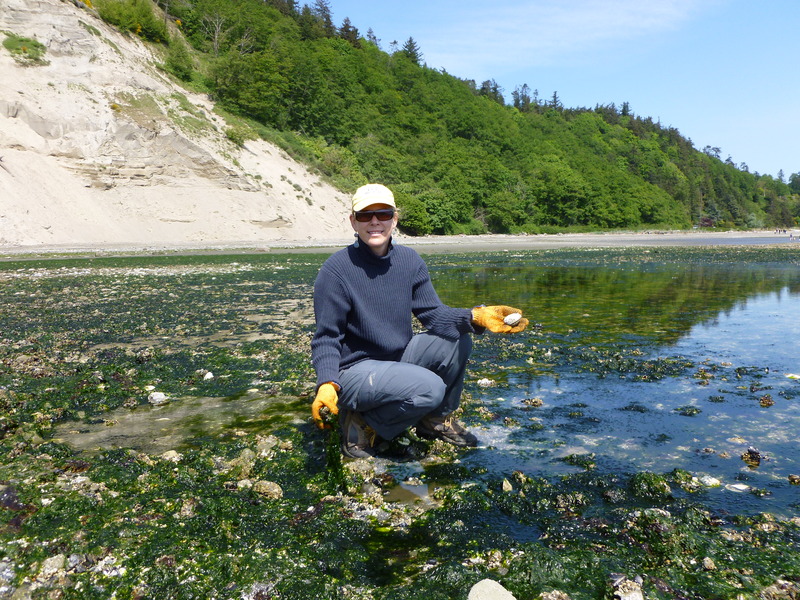 When looking for mussels, go to areas of the beach where there is a rocky bottom. Pick mussels that are as big as your thumb. Let the smaller guys grow. Simply grab the mussel, twist and pull off. Fill the bucket with cold water right from the harvest area and let them rest for a minimum of several hours. They will literally spit out sand and debris. This ensures you don’t have gritty mussels. Avoid soaking mussels in tap water. It’s time to crack open a beer or open up a bottle of white wine because you still have some work to do and you should reward yourself for such a catch. Pinot Gris and Sauvignon Blanc are great wines to pair with mussels. Clean the mussels by rubbing off any debris from their shells. 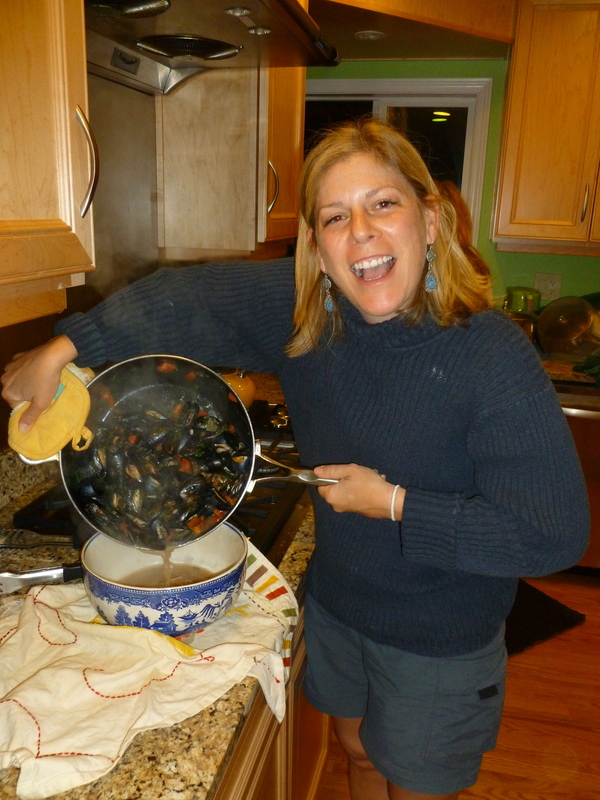 Throw away any mussels that are cracked or remain open after tapping them on a surface. Remove the beard, a small hairy spot where the two parts of the shell connect. Sometimes you can just pull it away, but scissors also work. Do this just before cooking. 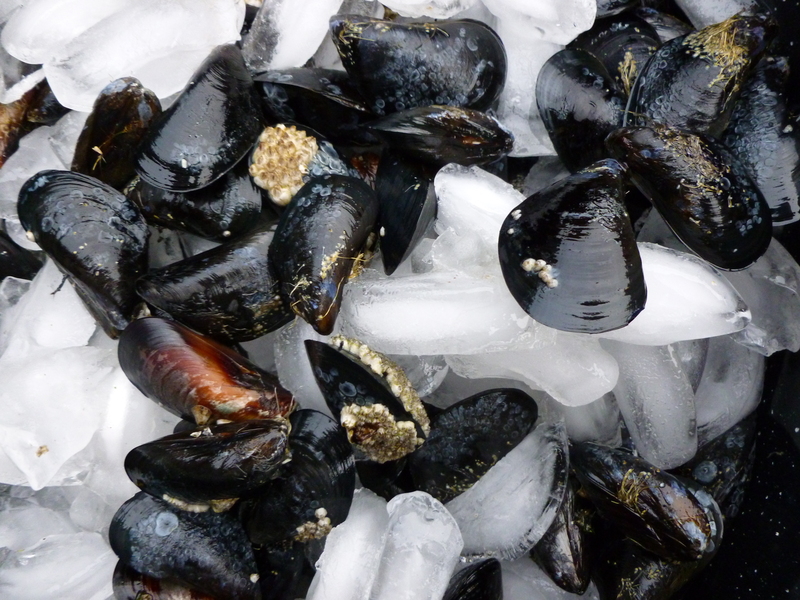 Mussels you don’t plan on cooking right away should be removed from the cold water and placed in the coldest part of your refrigerator on a bed of ice with a damp cloth on top of them. Mussels will keep for up to three days. I adapted a recipe from Chef Walter Pisano of Tulio restaurant printed in Celebrated Chefs, Vol. 2. Feel free to play with the ingredients and put your own take on it. Heat oil in a large saucepan over medium heat. Add the garlic and cook until golden brown. Add mussels and stir constantly for 2 minutes. Cover and cook for 2 more minutes. Then add tomatoes, brandy and lemon zest to the pan. Cook an additional 3-4 minutes or until the mussels have opened. Remove lid and gently stir in basil, parsley and pepper flakes. Serve immediately in shallow bowls. Posted in Food news, Recipes and tagged cook, harvest, mussels, recipe, washington state. Bookmark the permalink. An award-winning journalist with a passion for food. A writer and speaker who hopes to inspire everyone to take adventures with food. If I'm not cooking, I'm not happy. I started this blog to inspire single people out there to cook and experience food. Yum! Thanks for the links and recipe. I’m totally making these. Also great Cioppino style or with Thai red curry. Awesome idea Chris. Mussels and red curry is a great combo. Love the blog! Can’t wait to see what comes next! AWESOME! Sounds delish and easy to make! My kind of cooking! Christine, love your blog, and will go back for thorough reading. You sat next to me at the Marche dinner. Thanks Maria. It was a great dinner and wonderful conversation. I hope you enjoy some of my blog posts. HI. Just wanted to note that It is VERY important to be aware of quarantine periods, especially in California, between the months of May through October. Oregon doesn’t have scheduled quarantines, but state wide quarantines are occasionally put in place. The quarantine is due to high marine toxicity levels. Poisoning can be deadly.